Bill Liblick: The Voice of The People! YOU'RE AN ANIMAL: Two of television's hottest sticom writers Amy and Wendy Engelberg call Bill an "Animal," on the set of "Maybe This Time." In the show Bill uses the slogan as the theme of his talk show. 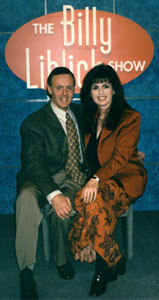 WITH MARIE: Bill poses with Marie Osmond on the set of THE BILLY LIBLICK SHOW. Who else could play an outrageous talk show host yelling at America's sweetheart Marie Osmond, none other than Bill Liblick. Familiar with Bill's popularity on television talk shows, and his desire to host his own talk show. Comedy writers Amy and Wendy Engelberg wrote Bill into the script of the ABC sitcom "Maybe This Time," starring Betty White and Marie Osmond. In the plot, Marie's ex boyfriend comes to town, a man she dumped many years ago. He invites her to go with him to a talk show. It turns out the shows topic is -- "YOU DUMPED ME, WELL LOOK WHO'S MAKING THE BIG DUMP NOW." That's right Marie Osmond is led to the Billy Liblick Show, where the slogan is "YOU'RE AN ANIMAL," a phrase Bill coined on talk shows yelling at the Klu Klux Klan. The segment proves to be hysterical, with Marie and Bill going at each other. The audience yells at Marie, as Bill attacks her for dumping her ex-boyfriend. Bill yells at Marie, 'YOU USED HIM, YOU TOYED WITH HIM, AND YOU THREW HIM AWAY." All the while, the characters played by Betty White and Amy Hill are watching the show from the coffee shop they run. 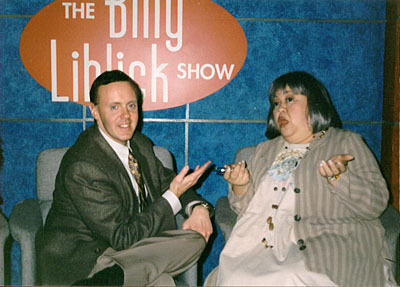 In a further attempt to make THE BILLY LIBLICK SHOW real, the writers ended the show with a segment from Talk Soup highlighting Marie's appearance on the Billy Liblick Show. 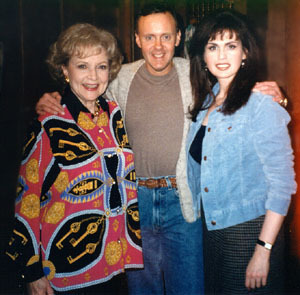 WITH AMERICA'S SWEETHEARTS: Bill poses with two of our country's most loved performers Betty White and Marie Osmond during a break in the taping of the sitcom "Maybe This Time." 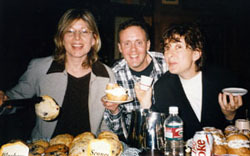 MUFFINS ANYONE: Comedy writers Amy and Wendy Engelberg join Bill on the set of "Maybe This Time." Amy and Wendy are currently writing for the hit sitcom "Clueless." They have several television pilots and movies in development. 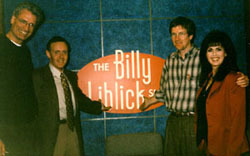 ON THE SET: Veteran director David Trainer, renowed Executive Producer Bob Young, and America's sweetheart Marie Osmond pose with Bill on the set of THE BILLY LIBLICK SHOW, during the taping of the sitcom "Maybe This Time." CHATTING AWAY: Bill talks with famous comedy actress AMY HILL on the set of "MAYBE THIS TIME."